Good Sunday morning, folks! I hope everyone has enjoyed this weekend so far (I sure have). 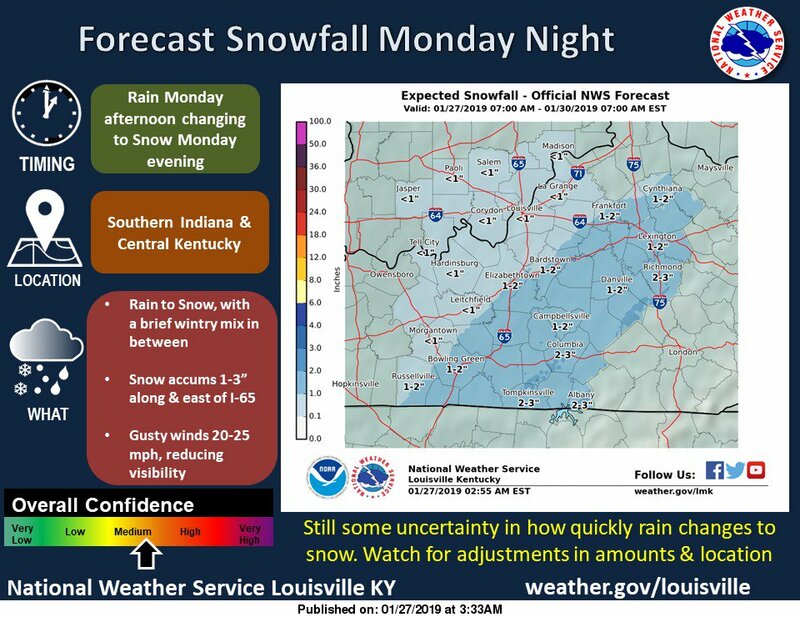 Enjoy the next couple of days, because wild, wintry times are ahead beginning Monday night. As you’re heading out for church or to run errands this morning, you’ll note that the weather….isn’t all that bad, honestly. Temps are in the lower 30s region wide right now, and with only a few clouds out there right now, we should be able to warm up relatively quickly this morning. Expect some more clouds to filter in today, but overall, it shouldn’t be too bad of a day out there. Partly sunny skies will dominate, with highs in the low and mid 40s. Winds will begin to shift from northerly to easterly and then to southerly during the overnight hours ahead of our next weather maker. 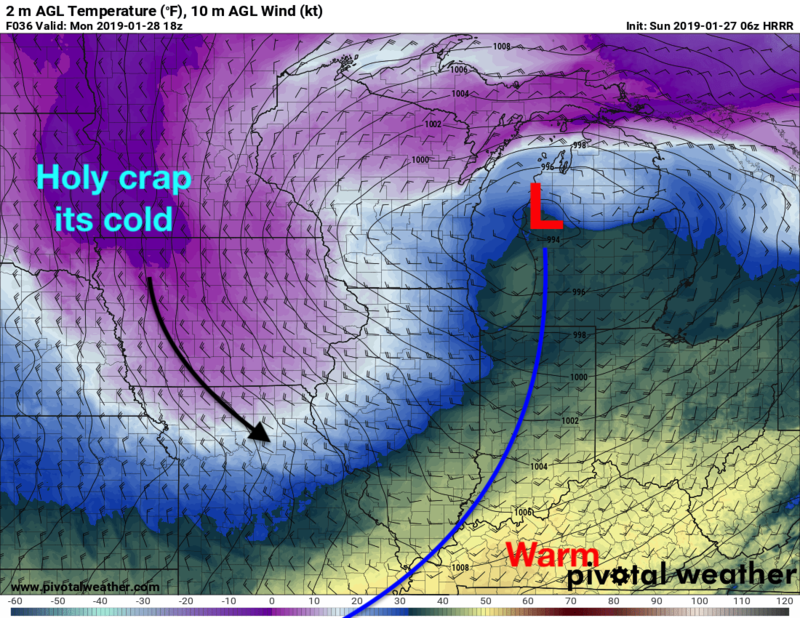 A strong low pressure system moving across the lower Great Lakes is what will do it! This will be dragging with it a potent cold front that will crash through on Monday night. BUT before that, we’ll have a little taste of spring! Yes, that is right! With winds expected to be gusting in the 25 to 30 mph range from the south, expect highs to jump into the low to mid 50s. Remember the cold front I mentioned? That is our primary weather culprit during this forecast. 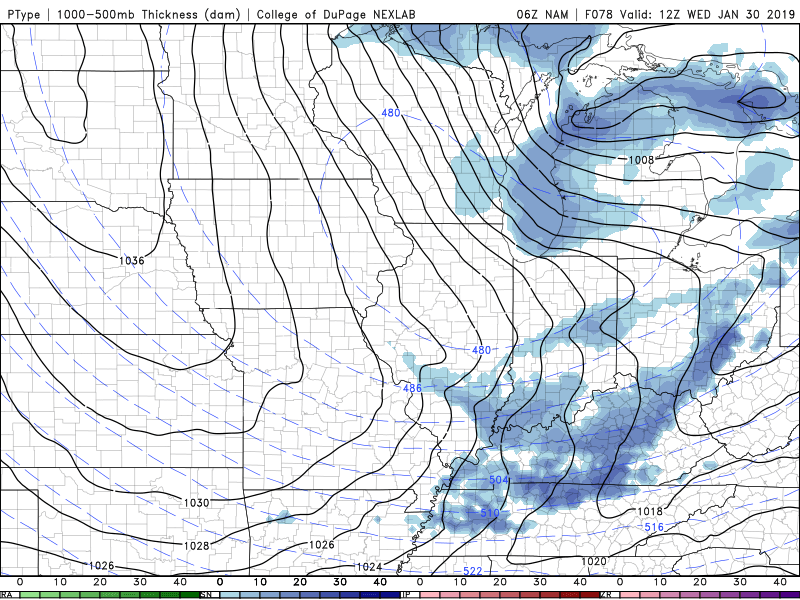 This cold front will bring an intense and sharp temperature drop, and it should lead to some snowfall on Monday night. This would lead to subsequent travel issues across the region. Let me break it down for you. Monday will be warm. Highs will jump into the low or mid 50s ahead of this cold front within strong southwesterly flow. The cold front will begin approaching the region on Monday evening. Models have it pegged to pass through around 9 pm, with temperatures falling from the mid 40s into the upper 20s within a few hours. In association with this front, you’ll see clouds rapidly increase across the region, and rainfall develop in the evening hours. As the cold front passes, there looks to be plenty of forcing behind it to create a band of heavy snow beginning between 10 pm and Midnight. From there, the snow looks to last for a few hours, and could give us an impactful event. The models, however, are a bit all over the place with this. The consensus right now has the region looking at 1-2″ of snowfall, but some model data is trending higher right now. This certainly isn’t an easy forecast. Stay tuned to the situation, because this could change significantly in the next 36 hours. Schools and businesses could be impacted, with temperatures plunging into the lower 20s by Tuesday morning. This is a very dynamic forecast, and I do expect some shifts in the forecast one way or another. Don’t expect highs to get above 30 on Tuesday, so any snow that we get likely won’t melt much. Another cold front looks to push through laaaaate on Tuesday night and into Wednesday morning, and I think this is another one to watch for impactful snowfall. 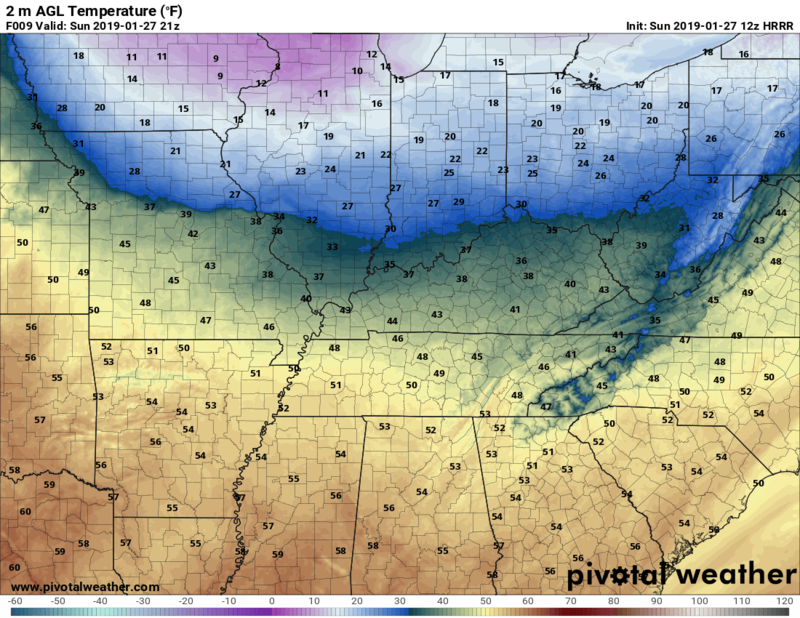 The cold front looks like it will push through the region right before rush hour on Wednesday morning, bringing a shot of snowfall, and really cold temperatures. By Wednesday afternoon? Temperatures may be in the lower teens, and maybe below 10ºF! Yep, you could say that by Wednesday, winter has truly arrived. Well, that is all I have, folks! Be sure to follow @wxornotBG on Twitter and Facebook for the latest on the snow situation over the next couple of days. Have a good one!